Worst part: The slight tonal shifts. Most movies, from coming-of-age dramedies to soul-sucking horror-thrillers, rely on their lead characters and actors. Existing to entertain and/or inform, these people become avatars for viewers to envelop. Stepping into their shoes, we follow them through thick and thin as they trudge from the conflict to the climax to the resolution. Mostly, we follow the good guys as they hit multiple obstacles and conundrums. However, with The Guest, we tread a much darker path towards one helluva pay off. Dan Stevens switching from Downton Abbey to the dark side. 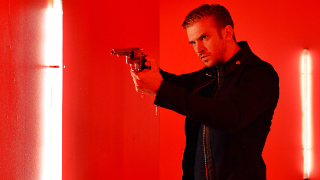 Watching The Guest could be seen as one of 2014’s most confronting experiences. Throwing several emotions and tonal shifts at us, this psychological-thriller might just push audiences over the edge. In crafting this efficient homage, the filmmakers and actors involved hit their strides. In addition, beyond the movie’s glowing positives, its production and distribution schedules took several fascinating turns. Blitzing the festival circuit, the movie’s wide-release-level success speaks wonders for its overall quality. The marketing, showing off its silky smoothness, gives away a small fraction of the narrative’s true genius. From the get-go, the story delivers enough chutzpah to please average film-goers, cinema aficionados, pretty psychopaths, and everyone in between. In the opening shot, two bootstrapped feet run along a dirt road. Who owns these feet? Where are they going? And why are they running through such hallowed ground? Of course, these answers come to light in the next scene. These camouflage blazoned feet belong to David Collins (Dan Stevens), a drifter searching for somewhere to call home. David, a discharged soldier thirsty for retribution, knocks on the Peterson family’s door. Having watched their oldest son, Caleb, die in Afghanistan, David fulfils a promise to pass on his last messages. The matriarch, Laura (Sheila Kelley), invites him to stay. However, the patriarch, Spencer (Leland Orser), isn’t impressed and the younger Petersons, Anna (Maika Monroe) and Luke (Brendan Meyer), are suspicious of his sinister behaviour. Newcomers Maika Monroe and Brendan Meyer making left and RIGHT career turns. Like our pseudo-titular character, The Guest reels us in before throwing us out into the cold. As an intensifying roller-coaster ride, the story has more brains, heart, and brawn than most blockbusters. Like Alfred Hitchcock’s seminal works (Shadow of a Doubt, in particular), the twists and turns revolve around our characters. After the gritty first few minutes, the movie stands by its lead anti-hero. Chronicling each word, decision, and movement, the movie steadily raises the stakes whilst injecting doses of pathos. In the first third, the story delivers a familial drama devoid of clichés, unlikable people, or sappy moments. Subtly, the blackly comedic moments alleviate its distressing aura. Beyond this, In buying beer kegs for Anna, having a beer with Spencer, and crippling several of Luke’s bullies, David becomes a fascinating and intriguing specimen. In fact, for the first-two thirds, he’s presented as a vengeful warrior in the vein of Ryan Gosling’s Driver. Thanks to his hyper-intelligence, quick wit, and stunning physicality, it’s difficult not to like him. Eventually, with the tension building throughout, everything crashes down around our invigorating lead character. In the last third, With kooky plot-twists coming thick and fast, the tone too often switches from sickening drama-thriller to Terminator-esque action spectacular. However, the climax and resolution deliver the break-neck pacing, nail-biting jolts, and applause-worthy moments to warrant multiple viewings. 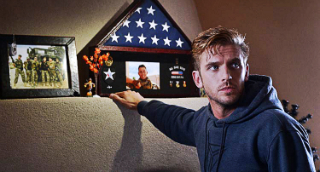 “I’m a friend of the family.” (David Collins (Dan Stevens), The Guest). Stevens’ David kick-starting a psychologically warped thrill-ride. Credit belongs to Stevens for making such a courageous career transition. He, further stretching his range, delivers a devilishly appealing performance as the friendly, neighbourhood psychopath. Each facial expression and mannerism adds to the character’s enthralling arc. Playing to a more mainstream crowd than their previous efforts, director Adam Wingard and writer Simon Barrett(You’re Next, A Horrible Way to Die)’s latest reshapes and elevates their dynamic. Impressively, Wingard and Barrett’s latest balls-to-the-wall extravaganza tops their 2013 horror-thriller smash. To a certain extent, this action-thriller pays homage to everything they grew up with. Beyond the Hitchcockian narrative threads, this inventive partnership tackles nearly every 1970s, 80s, and 90s Hollywood trope. In particular, their directorial and screenwriting flourishes allude toJohn Carpenter flicks including Assault on Precinct 13 and Halloween. Bundling together revenge-thriller, horror, and action tropes, audiences will be left awe-struck by the movie’s vitality and determination. Throwing in effective jump scares and action beats, Wingard’s style toys with many zany concepts. Fuelled by neon-lit interiors and neo-western vistas, the world building bolsters this pulpy and relentless sensory assault. From the prologue opening to the Halloween-themed-prom finale, each frame further solidifies the movie’s immaculate legend. 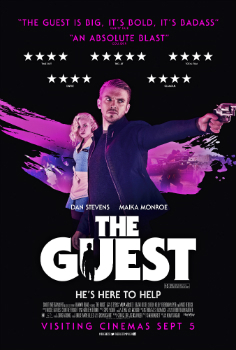 Fulfilling its many promises, including honouring our fallen comrades overseas whilst tearing apart the military-industrial complex, The Guest is a slick, ferocious, and manic action/horror-thriller romp. Overcoming its minor flaws, the movie bolsters Wingard and Barrett’s reputations. Nailing its self-aware, nostalgia-drenched vibe, this psychological-thriller comes off like its lead character – tough, surprising, and willing to tear chunks off its adversaries. As 2014’s Stoker, its trashiness and joyousness make for one of the year’s biggest surprises. Verdict: A lean, mean thrill-machine!